Show Us Your (Hopefully Non-Ferrari-Mutilating) Car Event Pictures! It’s the weekend! It’s summer! You’re probably out enjoying yourself, possibly attending a Cars & Coffee where a Ferrari got mutilated by a Mercedes, or some other car events. Show us what you did this weekend! Did you work on your car? Go to a track? Get up way too early to go look at cars in an abandoned mall’s parking lot, like I did? Show us what you’ve got. When I wasn’t crying over the scarred face of that Ferrari 458 Speciale, I made it to the Morrisville, North Carolina Cars & Coffee, which is one of my favorites in the area because it’s right next to an airport and there’s a Michael Bay movie moment every ten minutes. From last month’s Morrisville Cars & Coffee. Unfortunately, it was really cloudy so the airplanes weren’t easy to spot, and doubly-unfortunately, my camera died after only grabbing a few snaps, so you’ll have to make up for it by sharing your pictures, Flickrs, or whatever other sort of media you have, in the comments. It doesn’t have to be from this weekend, as it has been about a month since we’ve done one of these. Show us anything car related you’ve been up to. 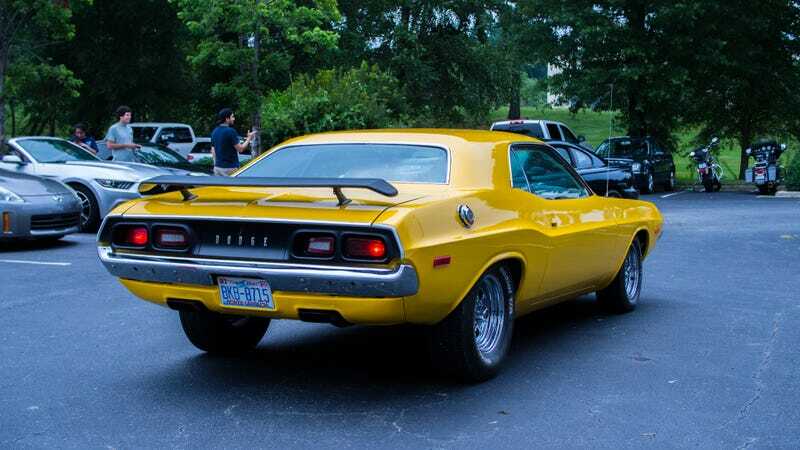 The best yellow on a car I have ever seen. Second best yellow, which matched the “Baby On Board” sticker in the window. An old dog and a pupper! So it was almost impossible for me to get a good contrast when editing these BMW photos, but the blue M3 is not the same color as the M2. The M3 is in ‘Atlantis Blue’ and has a greener shimmer than the gorgeous ‘Long Beach Blue’ on the M2. I think I’d go with the ‘Long Beach,’ but both are fantastic. Also, the little blue accent in the grille of the M3 is knuckle-biting. Don’t talk to me or my son, or my son’s son ever again. Actual Fit racecar. No back seats. This guy tracks. I want one. So both of these motion shots were me trying to do that cool effect you see in racing photos, except these cars were going about two miles per hour. I still sorta like them, though. Alright, it’s your turn to show us what you’ve got. Show Us Your Cars & Coffee Pictures!